Neil Peart is by far one of the most popular drummers of his time. Playing for one of the best progressive rock bands still around to this day ( Rush ), he has become well known to both drummers and non drummers. Neil Peart is known not only for his drumming for Rush, but also his extended solo’s that are clearly his own style. Peart has his own line of drums with DW, his own instructional DVD’s, his own books, and his own list of awards. He is definitely more than just a drummer; however his skills on the drum set cannot be ignored. Neil Peart was born on September 12, 1952 in Hagersville Ontario Canada. He always knew he wanted to be a musician, although he worked different jobs in his early years. When he was 13 years old he received his first drum set. It was with this kit where he knew he wanted to be a drummer. He eventually dropped out of school to follow his musical dreams. He played for many various bands in town before he decided to go to England to pursue his music there. This unfortunately was a failure and eventually returned back to Canada to join the band Rush in 1974. Rush was and is Neil Pearts greatest achievement. With over 23 albums and one in the works right now, Rush is definitely a major band. Neil Peart is more than just the drummer for this band, he is also the lyricist. Since Peart is a writer, he always had interests in lyric writing. Before he even joined Rush he already had a few song lyrics written. Fly by Night was one of Neil’s first songs to be completed by Rush. This proved to be a very popular song! Rush started in 1974 and is still going to this day. Their popularity is huge worldwide and has hit the charts with every album they have made. Tragedy struck Neil in the summer of 1997 when his 19 year old daughter Selena was involved in a fatal car crash. Soon after that, Peart’s common law wife died of cancer. This tore Neil apart, and retired from Rush. Neil went on a number of motorcycle trips across the USA to reflect on the loss of his family which he later documented in one of his books, “Ghost Rider: Travels on the Healing Road”. After time to mourn, Neil Peart eventually rejoined former band mates and began writing for Rush again. Obviously Peart is successful with his band Rush; however his achievements go way beyond that. He has written 4 successful books in his life: The Masked Rider: Cycling in West Africa, Ghost Rider: Travels on the Healing Road, Traveling Music: The Soundtrack of my Life and Times, and Roadshow: Landscape with Drums. Peart has also created 2 instructional DVD’s: A Work In Progress, and Anatomy of a Drum Solo. This, along with his numerous Rush albums has given Neil quite the library. Peart has been given a number of awards and honors in his lifetime. He was indited into the Hall of Fame in 1983. He was given the Best Rock Drummer award for 6 consecutive years in the early 80’s. Peart has also won best al around drummer, best multi-percussionist, best instructional video, best record performance and more. He has a long list of awards. Neil Peart has played on a variety of drum kits. When he was young he played on a Slingerland drum set. He then moved on to Tama, where he played for 7 years of his life. Following Tama, Peart played on a Ludwig drum set. These were one of his favorite drum kits to play on. In 1996, Neil signed on with DW drums where to this day he still plays. He has a signature DW drum kit that has a variety of different Rush images on it. Peart also includes a mixture of Roland V-drums with his kit. Peart has a massive drum set up that completely surrounds him. He has a mixture of DW and Roland electric drums. As for cymbals, Neil only uses Sabian. He has a line of cymbals with Sabian called the Paragon cymbals. Although Neil Peart is known for his soloing and performance in Rush, he is much more than just that. He is a song lyric writer and author as well. His style of drumming has left a mark in the music world that will be there for years to come. Neil is no where near his career end as he is in the studios as we speak creating his next Rush album! 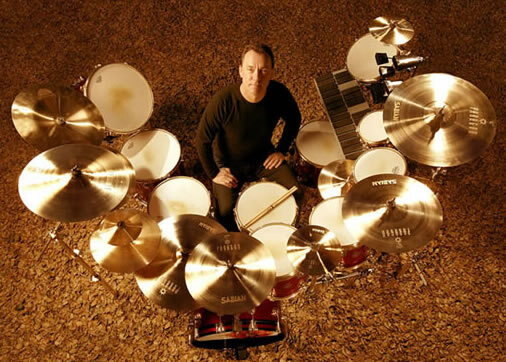 Make sure that you check out these free drum videos of Neil Peart. Also if you are interested in reading more famous drummer bios be sure to check out our new drum lessons site!